Madness ensues at Earl Beatty this Saturday with the school's annual Fun Fair and Ball Hockey Tournament. Neighbourhood children will descend on the tarmac and toe the line for some friendly games of shinny. Those not interested in watching the cuteness unfold, there will also be a bouncy castle (shoes off, please!!! ), a silent auction, a market place, face painting, bake sale items, lots of yummy food and games and activities for children of all ages. What I didn't know about Earl Beatty, but am very happy to be able to announce, is that they are a TDSB certified EcoSchool. This is very cool and I can't wait to send my kids there - however, in the meantime, on Saturday the eco-staff will be on hand promoting waste reduction and selling healthy snacks. They please ask that you bring your reusable mugs for water! Here is a link to their blog and a poster with details about how to sign up for the ball hockey part of the day. Don't miss out on some fabulous stuff (a lot of it NEW or gently used). This is definitely not your ordinary sale of junk - there are some true treasures to be had:) There will be household and decor items, baby stuff, some furniture, books/cds, clothes, etc... Best of all, all proceeds are going to a great cause! Come rain, come shine, people in this 'hood really love their farmers' markets. The proof is in the pudding: according to Farmers Markets Ontario, the East Lynn farmers' market was one of the most successful community farmers' markets in the GTA. 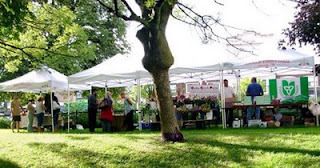 Hard to believe, pitted against the likes of the City Hall market and (gasp!) Sorauren Park's market in the west end. FMO has touted our market as the "new model" for community markets. This year's market will be even better than last. When the stalls go up for opening night tomorrow evening, it marks the start of a summer of community festivities every Thursday. Concerts, a square dance and a movie night are just some of the things to look forward to. You can check out the new website for the market here: www.eastlynnfarmersmarket.com. It has a great list of all the upcoming events and a list of vendors. I'm looking forward to the Strawberry fest and potluck on June 18th. Just an FYI: I make the best chili around!!! Trade in some sun worship for some sun salutations, to get those gams toned and ready for the season. Yoga enthusiasts can join the 2009 edition of Passport to Prana, an amazing yoga program that for $30 let's you try one free class at over 50 participating yoga studios. There are four within shouting distance of Danforth East: Bikram Yoga Beaches, Change Studio, Moksha Yoga Danforth and The Yoga Sanctuary. If you go to one class at each studio, that works out to be $7.50 a class - half of the usual cost!! More info and studio addresses here: www.passporttoprana.com. 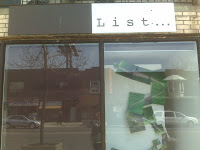 When I last posted about Legacy Spinning Studio on Danforth, way back in April, they hadn't opened yet. They're in full swing now and offering not only spin classes, but personal training, running groups (yay, I'm in for this one!) and golf lessons. If you want to try it, there are free classes for the rest of May for any new participants. The coolest feature about Legacy is their promise to people who become paid members: the more weight you lose, the bigger the discount on your next round of services. According to owner and Danforth East resident Andy, the first member signed up three weeks ago and has already lost 11 lbs. Their website has a listing of all the classes. The only thing in this world I like better than delicious ice cream is FREE delicious ice cream. Apparently, I’m not the only one. On Sunday, more than 800 locals showed up for the Grand Opening of new neighborhood hot spot (cold spot?) Carter’s Ice Cream. Carter’s owners (and area residents) Tammy and Monty and their crew were a very busy bunch for the three hour bash, handing out balloons and free scoops of incredible Kawartha Dairy ice cream to the hungry crowd. Carter’s may be the new kid on the block, but I’m predicting that pretty soon people won’t remember what life was like before it moved in to the neighborhood. 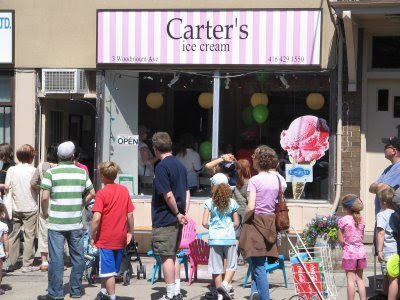 With superb ice cream, an ideal location (right across from East Lynn park), and warm and friendly service, Carter’s Ice Cream is a very welcome addition to the area. Many years ago (okay, maybe only 3 or 4) our darling Canadian author Margaret Atwood met an eager young author named Vincent Lam on a cruise. This fortuitous meeting led to Lam winning the Giller Prize for his book that he was working on when he met her (and she then helped publish). What does this have to do with Danforth East? This weekend marks the end of LitCity Toronto - an endeavour by the City of Toronto to link authors and their books about Toronto to the locations they've written about. Lam's award winning compilation of short stories Bloodletting and Miracle Cures was inspired by the author's own experience as an ER physician at our very own Toronto East General Hospital. So, as part of LitCity, Mr. Lam himself will make an appearance for a reading at S. Walter Stewart Library this Sunday (May 24) from 2 – 2:30 p.m. Check out the LitCity website for more info about this weekend's events! I'm reading a book called Emerald City, by John Bentley Meys, about Toronto and its changing landsape. It got me thinking about urban renewal and how it applies to Danforth East. I thought that this photo I found in the City of Toronto archives is a good reflection of how drastic some changes are when looked at over a large arc of time. This is the proper of East Lynn park in 1931, before it was filled with Phil & Teds strollers and local children and dogs frolicking on the grass. 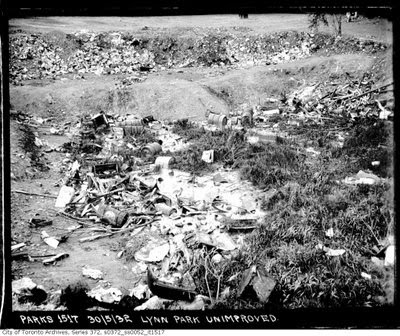 The park was cleaned up eventually, in 1932, thanks to the City's public works department. With Angels & Demons breaking records at the box office, I'm sure our minds these days are all on secret societies and clandestine meetings, which is why I was more than pleased to uncover a secret society in our very own East York. Okay, it might not be THAT secret, but none-the-less, I have the feeling that not many people new to the neighbourhood have gotten the newsflash about this group of urban historians. They are meeting Tuesday night (May 26) to hear Bill Gladstone speak. Mr. Gladstone is an author and Toronto genealogist. He wrote a book documenting 100 years of his families life, starting in Russia and ending in Toronto. He has some great insight into Toronto urban history. Probably worth a visit. Refreshments at 7 p.m., presentation at 7:30. I will admit that although I had the best of intentions, I never had dinner at Grato (the resto at the corner of Monarch Park and Danforth) so when it closed, I felt a pang of guilt for not supporting a local business. When Casa Di Giorgio opened in its place I rejoiced, but again, for months I said I was going to check it out but didn't. I finally had the chance to have a cozy dinner there a few weekends ago and I was pleasantly surprised. I had never tried their flagship location in the Beach, but many people have said that their pizza is excellent so I was enthusiastic to try it. 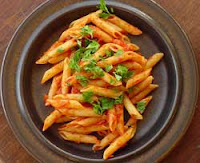 I ordered my usual favourite, Penne Arrabiatta, and it was divine. I've searched the city for a great version of this dish and this was by far one of the best I've had. Marcello's at St. Clair and Bathurst is a close tie for first. My dining partner ordered a linguine with chicken which was also exceptional. Relish and Ten Feet Tall have, up until now, been the go-to spots in the hood for "date night" dining but I think that Casa Di Giorgio can be added to this list. I for one, am just really happy that there is another great Italian restaurant near by***. ***As a caveat: I've never tried Quattro Reggaze but Chowhounders out there love it! For all you cycling enthusiasts out there, the City of Toronto's BikeMonth is coming up (May 25 - June 25). The "Group Commute and Pancake Breakfast" will be taking the Danforth by storm next Monday. If you want to join, the group starts at Danforth & Woodbine at 7 am on Mon, May 25, and will be commuting downtown in a big group. Usually, the group takes Danforth westbound until meeting up with several other groups at Yonge & Bloor, where then 1000s of cyclists go to Nathan Phillips Square for free pancakes. Who can say no to free pancakes??? For more info, check out: http://www.toronto.ca/cycling/bikemonth/group-commute.htm OR bikingtoronto.com. 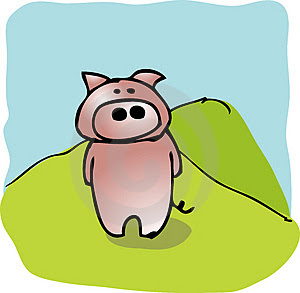 .....home again, home again, jiggity jig! It's time to shake off the winter cobwebs from your reusable grocery bags because farmers market season is upon us once again. Tomorrow (May 19) is the first day of the East York Farmers Market, where Bob the sweet potato guy and his cohorts will be setting up shop to provide us with the earthy goodness of fresh farm produce. Bon voyage Supercentre. We'll meet again in the fall! The market runs every Tuesday, from 9am until 2pm at the East York Civic Centre, 850 Coxwell Avenue. 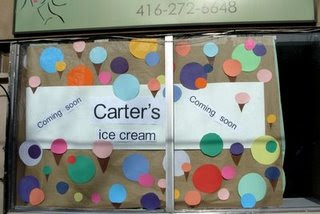 As mentioned last week, Carter's ice cream was hoping to have a soft opening in the near future. The good news is that they will be open this weekend, testing out their ice cream scoops and their milkshake machine. The official official opening will be Sunday, May 24 at which will be free ice cream cones and fun things for the kids like balloons and face painting - but in the meantime, if you're jonesing for some dairy delights this long weekend then head over to Carter's and enjoy some of that yummy Kawartha Dairy ice cream! I generally don't like my passport, because really, who actually likes their passport photo? 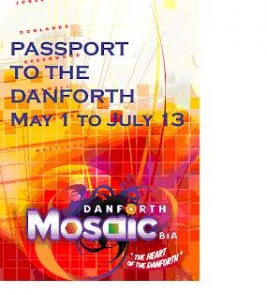 However, I was excited to open my mailbox the other day and find my Passport to the Danforth from the Danforth Mosaic BIA. For those of you who haven't had the chance to take a look at one yet, the Passport offers its holders a variety of discounts and freebies at Danforth businesses. Although its not a real flight ticket to exotic destinations, Danforth East can be an international journey of epic(urean) proportions. From Halal pizza on one end, the Ethiopian and Moroccan in the middle and the Italian at Woodbine, our Danforth can be a first class delight. So, use your passports and try something new! Here's a link to more info on the BIA website. What I've noticed about Danforth East homeowners is that although their little plots of land are small (for the most part), they take immense pride in keeping their front lawns and gardens neat and tidy. This past weekend, many families could be seen prancing amongst the tulips with trowels and other gardening implements, getting their yards ready for planting. Making a trip to the Depot's garden centre is always fun, or you could hob nob with the rich and famous at Sheridan nurseries but then you would be missing out on the Beach Garden Society's annual plant sale, which is happening with impeccable timing this Saturday (May 16). Because they are a garden society, I am betting that the selection of plants will be much nicer than you might find at the Depot and probably a bit cheaper than Sheridan. They are promising a huge selection of exceptional perennials. The sale is happening from 9 - 11:30 at 79 Lawlor Avenue, which is south of Danforth and west of Vic Park. More info here! Congratulations to Caley Feldman and Natalie Hosmer - the winners of my Java Jive trivia. I was thinking of the Manhattan Transfer song called Java Jive, when I wrote the post, but as Natalie pointed out, the Ink Spots were the first group to actually sing it so both Natalie and Caley are correct! Thanks to everyone else who sent me their answers. I will have to have contests more often!! The java jive is heating up on Danforth, now that "the coffee shop formerly known as Niche" has reopened as Three's Company, Too!!! (yes, they officially have three exclamation marks - that is not me being overzealous about my cuppa-cuppa). They've finally put up their new signage in the front window and it looks great. Judging from a quick poll of people I know who loved it as Niche and love it even more as Three's Company - Too, their baked goods and lunch menu is hands down better than anything that "the coffee chain who cannot be named" offers. The front runners on delicious items to indulge in are the Espresso Brownie and the Cranberry White Chocolate cookies. Heaven! Owners Terri and Carolyn are also launching an ice cream bar - yippee - which is just moments away from being in service. 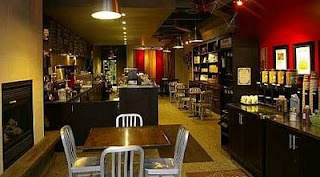 Niche is located at 1364 Danforth. Here's their site for more info. I'm really hoping to occasionally be able to post some Danforth East photos, taken by either me or my readers, so here is my first exhibit for you to enjoy - a familiar site to many of you who see this every day, twice a day (or more....)! Get ready, this is going to be a long post! Thank you to everyone who answered the call for reasons to love Danforth East. 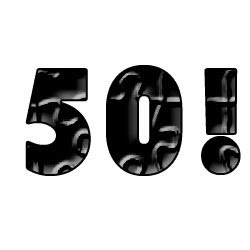 This list is actually 51 - I couldn't keep it down to 50. And there are way more things to add, but I'll save that for the next list. Being one of those young and 'house poor' couples that everyone talks about, my husband and I take DIY-ing seriously - even when it comes to home decor. I've made countless visits to Foamite, the foam store on Danforth, and haunted the front steps of Deserres incessently, so I was more than relieved to see that the forlorn framing shop that once sat at 1374 Danforth is being renovated and turned into a mosaic workshop called Mosaic Beach Studio. A transplant from Gerrard Street E., Mosaic Beach Studio has a loyal following, as I actually know a few people who have taken classes there. What I could garner from the brochure is that they will be offering classes in a variety of mosaic projects from beginner to advanced, but my favourite part is that they have the expertise to do things like design custom backsplashes for kitchens (*ahem* like mine). Or, I guess I could learn how to DIY it.....! Grand opening is on June 2nd. Check their website for more details! Quick correction on the Carter's post from yesterday: They've changed the grand opening to Sunday, May 24th, not the 23rd. And Carter's is named after Tammy's daughter - not her son. Yes, Danforth East is finally getting a real honest-to-goodness ice cream shop and it's sure building some buzz around the 'hood. Everyone is talking about Carter's Ice Cream on Woodmount Ave, so I couldn't help but pop in and get the 'scoop' from owner and ice cream aficionado Tammy. When I stepped into Carter's, named after Tammy's son Carter, I was transported into a fantasy world of ice cream. It's bright and warm and looks and feels like the kind of place to enjoy frozen treats on a hot summer day - with pink and white striped walls, a lime green ice cream bar and cute white kiddie chairs for pint-sized ice cream monsters. Carter's is quietly opening next week - this will be a soft opening to test out the cash register and the ice cream scoops - so keep your eyes peeled. The official opening party will be on May 23rd and will include balloons, face painting and free ice cream (samples, I'm assuming) so get there early. There are rumours they will be carrying a few flavours from Greg's ice cream, but I cannot confirm or deny that ;) ! Queen West West is surely the place to go for any avant garde art conoisseur, and as Leah Sandals at the National Post says "the stretch of Danforth between Greenwood and Coxwell can be sparse for the culturati". However, amongst the social clubs and empty store fronts Danforth East has its very own burgeoning underground art movement. List Gallery, located on the southside of Danforth between Gillard and Monarch Park, is the area's first contemporary art gallery and it's hosting a Contact Photography Festival exhibit this month called 'OH' by Donna Akrey and Janine Miedzik. Here is more info on the exhibit. The Gallery is open Wednesday through Friday from 1 - 6 and on Sunday from 1 - 6. As well, our very own Melanie's Bistro is exhibiting work by Frank Michael as part of Contact. His exhibit Evolutionary Revolution is a must see for anyone interested in seeing what the Berlin wall looks like now, in the 20th year since its literal destruction. I'm going, if only for a) the fact that my 13th birthday was the day the wall came down and b) Melanie's makes a mean Tandoori Wrap! Saturday morning found myself and about 20 others out front of Greenwood station for the start of this past weekend's neighbourhood Jane's Walk "The Life and Death of Upper Midway". It was a fascinating look at essentially75% of Danforth East - starting at Greenwood and ending well past Woodbine. Joe Cooper from the East York Mirror was our walking tour guide and he was a wealth of historical knowledge. Of course, there is much much more, but I don't want to spoil it for those of you that missed it and want to try it next year. It was an amazing experience and it definitely made me feel more connected to DE! The newest edition of Toronto Life just popped into my mailbox and its headline is '50 Reasons to Love Toronto'. This got me thinking about Danforth East and whether I could come up with fifty things that I love about DE. I sure could (S. Walter Stewart library, North Pole Bakery, Last Drop Cafe). However, I would much rather hear the reasons other people have for loving our little neck of the woods. So, send me an email at sarahkiriliuk at gmail with one or two things to add to the list. 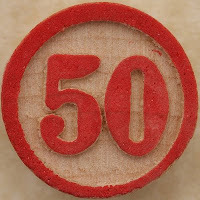 I'll publish our "50 Reasons To Love Danforth East" in a future post!